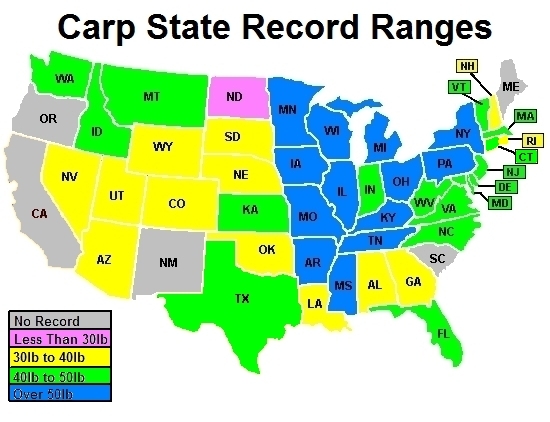 The following is a color map of the weight ranges of the current (as of spring of 2014) state records for carp. 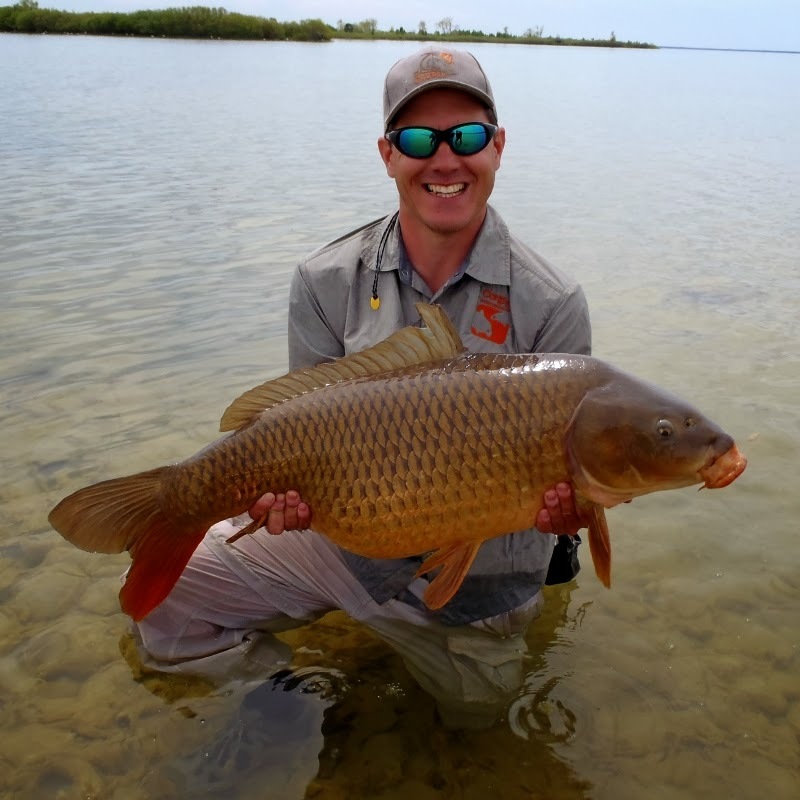 Seriously though, if you live in the Ohio river basin, the main Mississippi river basin, the Great Lakes drainage or the St Lawrence River basin you clearly have a distinct advantage in carp size over the rest of the country. 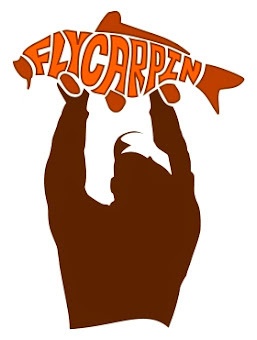 I am curious as to why Arkansas, Illinois, Iowa and Mississippi don't really have much of a voice in the fly fishing for carp revolution. All the other blue states have a strong presence. Or have I not been paying attention? The big rivers there are nasty muddy year-round, making sight fishing a real pain. I fly fished a lot while living in Arkansas, and never even dreamed of dunking a fly in the Arkansas river. Just looking at trends. Some of the big fish states are better fly destinations than others. Like MI. And MI. And possibly MI. Its not empty, they don't bother to track carp in those states. 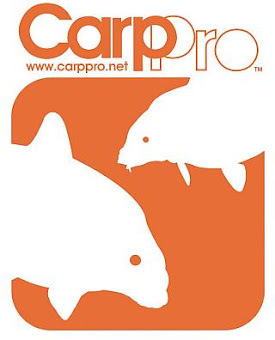 In Brooklyn, New York's Prospect Park lake (60 acres & 7 feet deep), I saw a 45lb carp caught from the shore. Yes we have big fish in NYC but they are extremely cautious. However, 10 lbs to 20 lbs are the usual catch. The stats are interesting! Some of the records I know are bow shot, and that may mean nothing. I would hazard a guess though that a record could come from any place, the colors notwithstanding. 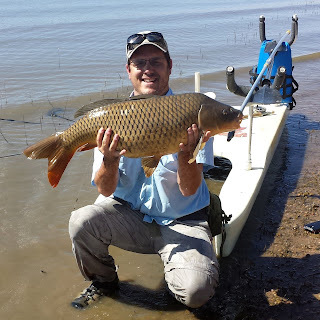 I fly fish for carp in Iowa. See my website, www.iowaflyfisher.com. 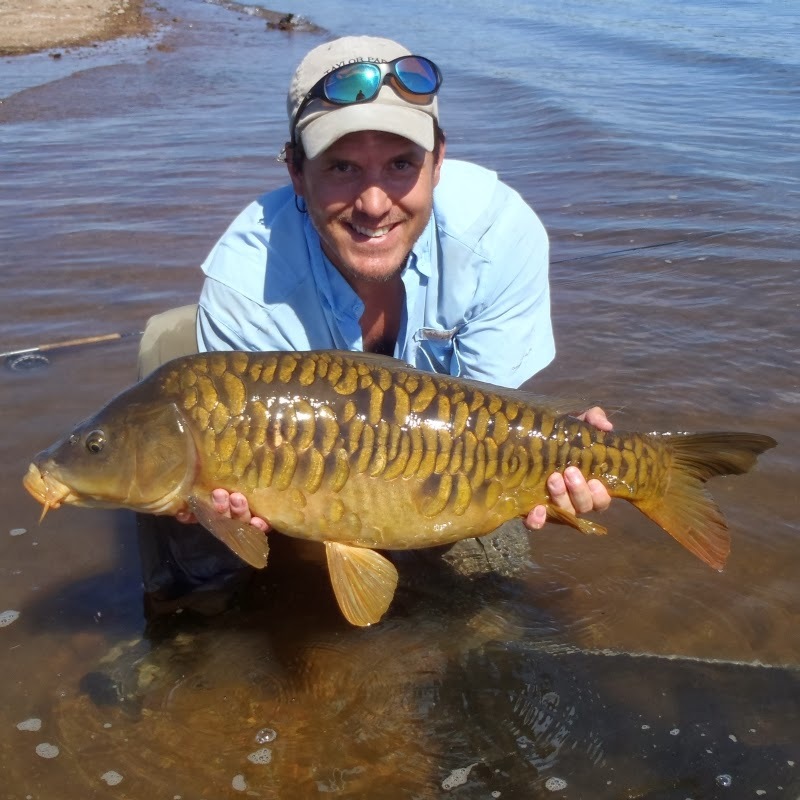 Our records may be impressive, but most of our carp are in the 5-8 lb. range just like everywhere else. The behemoths are freaks, and they probably come from the largest rivers where fly fishing is mostly impractical. 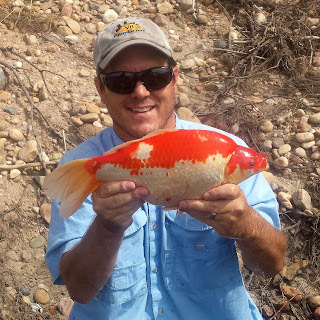 Interesting..California state angling record for carp is 52. Bow carp killing is prfoundly more popular than carp on the fly and it is a 60+ in that category. Hah!! Count on CA to be different David. They listed it under "minnow, carp" instead of carp or common carp and I missed it. Thanks, I will updated it tonight. Good to know Iowa. 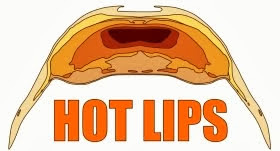 That is, of course, true for most big fish water. The big girls are frequently hard to access on the fly in many waters. This is really just a study of curiousity looking for a very broad trend which would be that the big carp potential would tend to be higher in the blue states than the yellow. 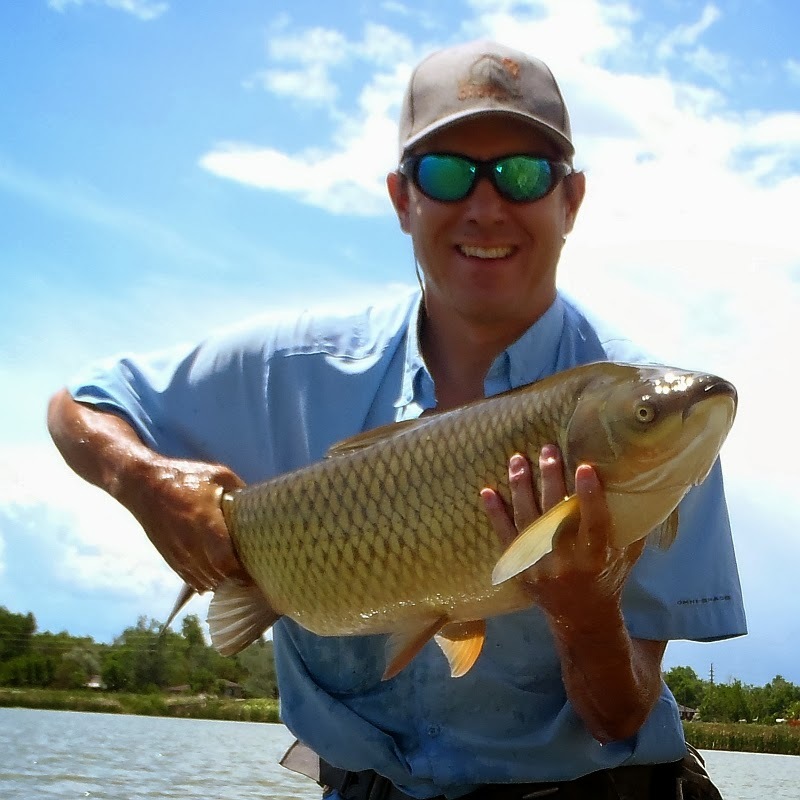 Cashing in on that potential with a fly-rod is a whole different story.